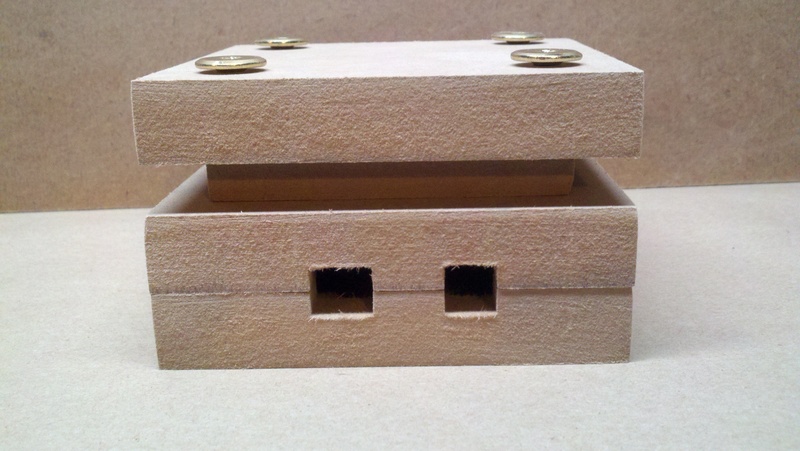 This prototype was fabricated in 0.75″ MDF using a ShopBot Desktop CNC mill with a 0.25″ spiral bit (Onsrud 65-023). 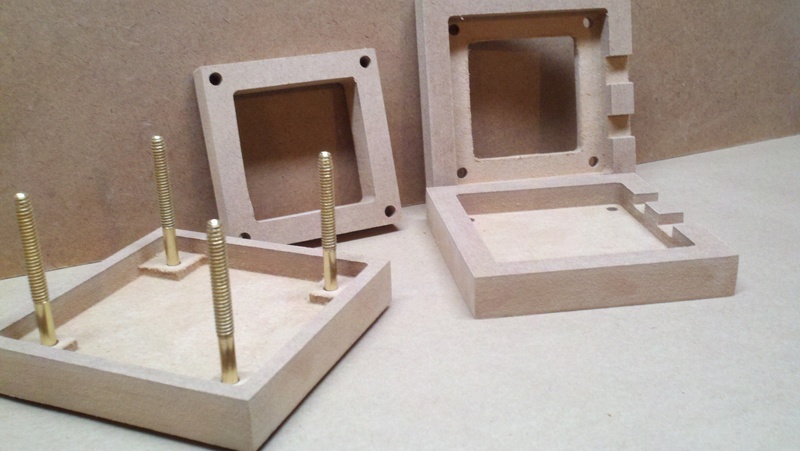 The two piece base forms a clamshell with a top opening for cables and back openings for accessing the Arduino power and USB connectors. The cap was hollowed out to allow a 0.75″ spacer to remain exposed only 0.50″, in keeping with the overall design. 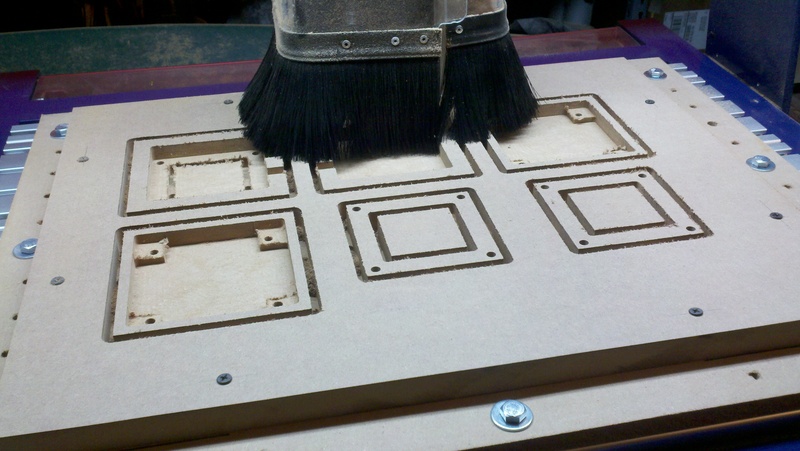 Tabs were used to hold the milled pieces in place after routing. Peck drilling was used to form the 0.250″ through holes for the connecting bolts. 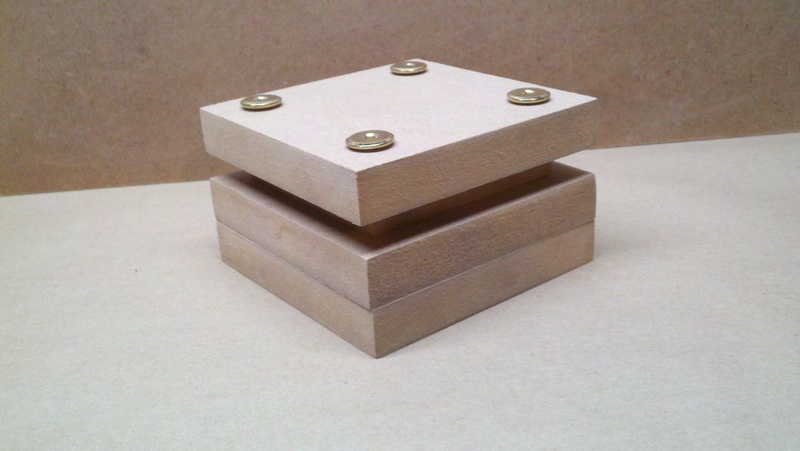 Post-CNC drilling was required on the cap to expand the through holes to 0.375″ diameter to accommodate the connecting bolt nuts. Having the connecting bolt heads on the bottom of the piece makes it easier to build up the stack. Here is the MDF panel as cut on the router. The upcut spiral bit left some “fuzz” on the parts which was easily cleaned up with a small wirebrush. An extra cap and spacer were run in the job. The milled pieces are seen here after cutting tabs to release and removing “fuzz”. The cap is shown with the connecting bolts in place (but opposite of how they ended up being used). The two-piece clamshell base is on the right, showing the cavity created for the Arduino Uno and WiFi shield. The cutouts for connector access can also be seen. Front view of the assembled stack for Prototype I. Back view of the assembled stack for Prototype I. The left opening is for the USB connector. The power connector opening is on the right. The Arduino connectors will be too hard to access with this opening design. A larger recess around these two openings will make it easier to reach the connectors. The internal cavity needs more room for the Arduino/shield combination. Need to consider how LED lighting would be mounted in the cap. The two halves of the base clamshell may not mate perfectly to appear as one solid piece. The next design should consider going the other way: create a relief cutout to show two separate.